It seems Google Analytics will not stop rolling out new updates so soon. 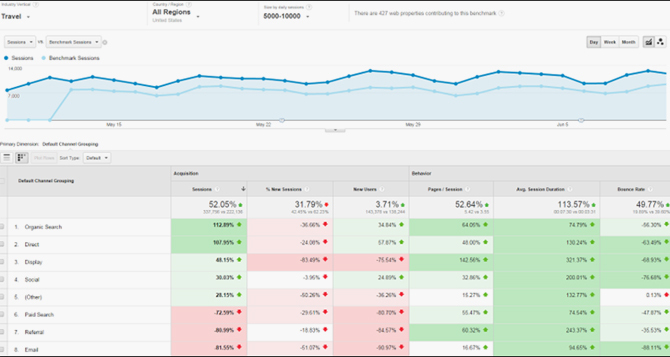 Even after the announcement of Universal Analytics out of beta, Google Analytics recently proclaimed to unleash new benchmark reports. Surprising isn’t it! These new benchmark reports will let users evaluate their results according to engagement metrics and industry standard acquisition. This proclamation further asserts that users can easily choose reports from 1,250 markets, 1,600 industry categories, and seven-sized buckets with metrics by location, channel, device category dimensions. Besides, the reports also consist of a heat map feature for recognizing those areas, where more resources and time could be implemented for better outcomes. Twiddy.com, a vacation rental company asserted that the latest benchmark reports of Google Analytics will help the company significantly in enhancing its email marketing efforts. Ross Twiddy, CMO of Twiddy.com says, “It was clear we were missing a huge opportunity in email marketing”. Twiddy further claimed that the company’s email marketing standard range open rate hiked to 48% and the company has also received a 40% hike in its click through rate after using the new benchmark reports. Google claimed that the newly unleashed benchmark reports can be used by the vacation rental company for comparing data points, which have impacted the conversion rates. According to Google Analytics, the analysis performed by the vacation rental company assisted them zero in on the factors, which were steady in repeat bookings such as rental type, location, price range, and even the vacation week that would probably convert for each patron. You can find the new benchmark reports in the “Audience” section of the reporting interface, but it will be accessible to the users who have picked in to share the data anonymously. For accessing the reports, you have to check the “Share anonymously with Google and others” option located in the account setting tab of Google Analytics on theadmin page. For companies looking to increase their online ROI, Google Analytics serves as an awesome piece of software providing actionable insights. You can hire web analytics consultants for data tracking and analysis who will help you to identify those channels of digital marketing that needs improvement.